This page is devoted entirely to you, so make sure you come back here every now and then to find out what’s going on in the Club. At each of our Junior races, we require at least 2x parents to help marshall the race. 1x parent is required to make sure all our Junior racers are ready to go at 6.40am, give the final instructions about the course, and then walk the competitors down to the swim start. The 2nd parent is required to keep an eye on the Transition area and offer assistance to the kids as needed. ADULTS ON DUTY – GET SIGN-ON LIST FROM REGO TABLE, DO ROLL CHECK, AND THEN CONDUCT A RACE BRIEFING BY 6.40am. START JUNIORS AT 6.45am AND RECORD RESULTS ON SIGN ON SHEET READY FOR PRESENTATION. TIMING IS NOT ORDINARILY TAKEN FOR JUNIOR RACES, BUT A SPARE TIMER IS AVAILABLE IN THE REGISTRATION BOX. SEE ALISON OR TRISH IF YOU WOULD LIKE TO TAKE ON THE TASK OF TIMING A PARTICULAR RACE. JUNIORS – IT IS YOUR JOB TO MAN THE WATER STATION FOR THE HALF AND FULL DISTANCE RACES MAKING SURE CUPS ARE FILLED AND HANDED TO COMPETITORS. It is a 50m swim. You will start IN the water, and swim out to one of our board paddlers. Swim around the paddler and then back to shore. We have 3 people on water safety so if you are in trouble or just want to rest on the board then put your hand straight in the air. Please take care to only tread on the rubber mat when entering or exiting the water. There are lots of very sharp oysters on the rocks. Your helmet MUST be done up before you unrack your bike. Your torso must also be covered and shoes must be worn. Wheel your bike onto the road, but WALK you rbike up to top of road. Then jump on, ride to Riverpark Rd, look BOTH ways, and turn left. Ride along Riverpark Rd till you get close to Commodore Cres. You will be turning right here,so look over your shoulder, make sure it’s safe,and move to the centre of the road for your right-hand turn. You must be using hand signals for all turns - if you are going too fast to make them then slowdown - you are riding dangerously. Watch the road marshall who’ll guide you round the corner. Ride to the end of Commodore, and turn around at the cul-de-sac, and ride back to Riverpark Rd.You will turn left and head back home. Before returning to transition, you continue to the end of Riverpark Rd, turn around at the Cul-de-sac, and ride back to McInherney Close, where you’ll turn left. Don’t take this corner wide – stay left as there may be on-coming cars or senior riders starting their bike leg riding towards you. You then ride along McInherney and down the ramp to transition. Jump off your bike before you get to the kerb. Once in transition you MUST rack your bike before you undo your helmet. Remember while riding, you must never overtake on the left-hand side. You cannot ride beside another rider and “chat” this is called blocking. Remember to please keep to your left if you’re not overtaking. And remember to make hand-signals if you’re turning into another road. To start the run you head out the back of transition (where you came in from the swim). Run up the road and along McInherney, turning left onto Riverpark Rd. Run along the footpath here until you see a witches hat in an open grassy reserve next to the water. This witches hat is your turnaround point. You then run back to transition to finish your race. Remember to be careful of senior and junior competitors on bikes near transition area. There will be fruit and water for you to cool down with. Please be mindful that if you are one of the front people that there are still a lot of us out there that would like some fruit also. Please remember that all our helpers are volunteers and have given up racing to make this race happen - so please follow instruction they may give you. It is up to the competitors to know the course - so arethere any questions ?? ...OK then, Enjoy your race! 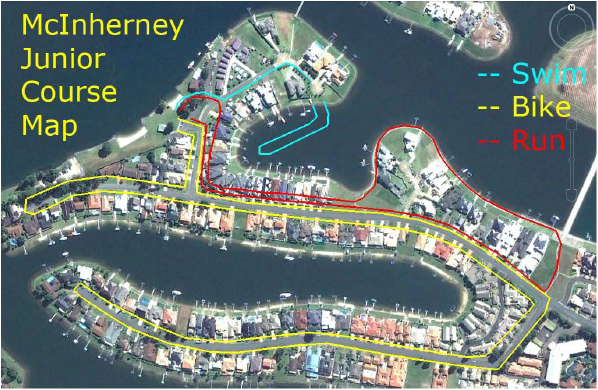 If you are a parent marked down for Junior Captain at a particular race, print this briefing off, and read it out to the kids on the day and ensure they get started by 6.50am. The Club has a small Giant race bike for our Juniors to share and gain experience racing on a proper road-frame with drop bars and STI gears. More recently, the Club was graciously donated another Junior bike (a Merida Extra-small) by Guy and Jo Trezise. Both of these bikes can be “loaned” out to any Junior who wants to book ahead for a particular race on our Calendar. As is the case for all our Club races, kids who want to participate in PMTC Club races must be over the age of 10 years (this relates to the RMS regulations relating to open roads and bike usage). However, there are a number of other regional events which will give younger kids a taste of what triathlon is about, such as the Junior aquathlons down at Camden Haven in March, or the Trial Bay Triathlons held at South West Rocks in February. These can be entered separately as those events open up their on-line entries. If you need any assistance, or should you have any other queries in relation to what your membership of PMTC will do for you.